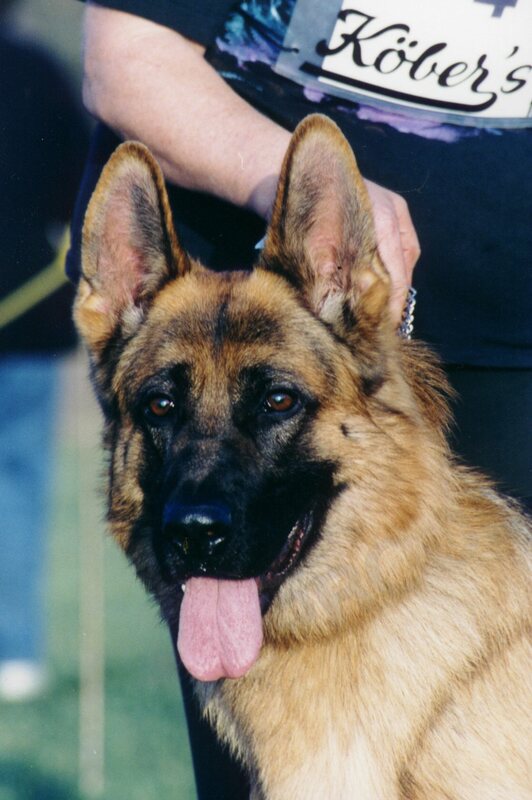 German Shepherd Dogs come in a variety of coat (hair) colors. Photo examples are shown below. The American Kennel Club (AKC) lists several. They include Black & red, Black & tan, Black & cream, Black & sliver, Black (solid black), Sable (Gray), Blue, Liver, and White. The breed should have rich, strong colors. Diluted colors are not desirable. Liver, Blue and White are genetically diluted colors, and are NOT bred by responsible breeders. White is a complete dilution of color, and disqualifies the dog from the Breed Show ring. Click here for more information on why white is not acceptable. The Whites can compete in performance training events only. The color of the dog is one of the less important attributes to consider when purchasing a puppy, as long as the colors are strong and well pigmented. The most critical things to consider are Temperament, Health and proper Structure. But, Color IS THE FROSTING ON THE CAKE! If you can get all the other qualities, and your favorite color, too...go for it! German Shepherd Black & tan or Black & red puppies are born nearly all black, and the colors continue to come in for the first few years of their life. The Solid Blacks ARE black at birth and stay that way. Sables are born all tan, and black tipping begins to come in at a few weeks old, and continues until the puppy is about 2 years old. Sables end up with 'wolf' type markings. Black & red means the markings are darker than the traditional tan... that is there is a reddish-brown tone to the markings. This is the most popular color in Germany. Black & tan is the traditional color popular in years past . Black & cream is a lighter shade of tan markings. Black & silver is less desirable as the tan has 'washed out' until it is almost white. As a buyer, how can you know that what you have in mind is the same color pattern that the breeder thinks of when using the same terms? Breeders have adopted some unofficial terms that give a better idea of the color patterns, but even with this, not all breeders use the same words for the same color patterns! What's a person to do? I have decided to include photos of what I am referring to, so as I describe the markings of my dogs, you can understand what I am referring to. Here are examples of Black & tan, and Black & red. I do not have examples of Black & cream, Black & silver, Sable, or White as I do not breed those colors. (Many black & tans will have a small amount of silver on their underside which is acceptable to me).